This one-of-a-kind resource bridges the gap between physical therapy and veterinary training. It provides an understanding of basic physical therapy techniques and interventions, empowering vets to effectively evaluate and treat dogs with debilitating conditions. Important legal and ethical issues are thoroughly explored, and regulatory practices and collaborative relationships are clearly explained. Provides thorough coverage of physical therapy, from historical aspects to diagnosis and treatment. Presents proposed cases and specific therapies that can be used as guidelines for the management of clinical patients. Features an extensive chapter on the physical examination of the canine, with information ranging from general orthopedic assessment to surgery. 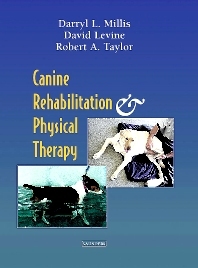 Discusses the applications of aquatic therapy for dogs in a chapter devoted to this type of therapy. More than 300 illustrations highlight key concepts and procedures.